RealtyShares has one of the best variety of investment options in the real estate crowdfunding space. They have proven to be reliable over the years and they provide you with great opportunities to diversify. RealtyShares was founded in 2013 and since then, they have brought more than 1,160 projects to their platform for their investors. In this time, more than $870 million has been invested in these projects by users of the platform. Their team has a lot of experience in the real estate, finance and technology spaces. It is a crowdfunding real estate platform that caters for sponsors, borrowers and investors. One of their main focuses is on smaller scale types of investments, like flipping single-family housing. Most of their competitors focus on bigger scale projects such as commercial and large multi-family complexes. You have access to many different real estate investment opportunities with RealtyShares for competitive rates, as you will have direct access to these project as RealtyShares does not have to go through a middleman. With RealtyShares, you have access to all different types of properties. This goes from single family homes, all of the way up to large commercial properties. You can choose from three different types of investments, each with their own return and risk profiles. These are debt, equity and preferred equity. With some of the products on offer with RealtyShares, you can make investments of as little as $1,000. This is a lot lower than many of their competitors. RealtyShares is very established in the business and has a strong track record of success. They also take their security very seriously. You have to be an accredited investor in the United States in order to use this platform. As there is no secondary market on RealtyShares, you have illiquid investments. Your money can only be freed up upon maturity of the project. The commercial middle market is overflowing with investment opportunities that often go unrealized due to capital constraints. Our goal is to provide real estate operators with a strong track record the capital they need to improve properties for higher, better use. One of the areas that RealtyShares stands out from the competition is that they focus more on smaller scale projects, as well as bigger projects. A lot of other platforms target big real estate projects, such as apartment complexes. RealtyShares prefers to break it down into smaller scale opportunities. Generally, they have better fees than a lot of the competition. There is a 1% annual fee for the management of the investments. There may be smaller further costs in relation to legal fees and the likes. They also have a minimum required investment of just $1,000 for most of their products. This is a lot lower than the $5,000 average that is in the sector today. This allows people to get experience in this crowdfunding real estate sector without having to sink in a lot of money starting off. Only accredited investors are able to invest with RealtyShares. Therefore, this is going to be a barrier to entry for a lot of people. It is also only open to residents of the United States. Another major drawback is that they do not have a secondary market on offer. Therefore, your investments are illiquid as you cannot sell them anywhere before they have fully matured. There is also the chance of further capital calls on a given project. This could see your investment proportion diluted when the project is seeking more capital than they previously wanted. With Realtyshares, there is an annual 1% fee for the management of your investments. There will also be some minor costs associated with the likes of legal fees when it comes to your investments. One of the main features of RealtyShares is that they have a wide range of different types of properties to invest in. This gives you a lot of scope to diversify your real estate investments. You can enter into large scale projects for the likes of commercial real estate or simply invest in single family housing. This is made even easier with the low minimum investment requirements. You also have access to three different types of investment vehicles. These are preferred equity, equity and debt. While most platforms have a couple of these on offer, it is rare to find al three as available options. The team at RealtyShares will first pre-vet all potential projects. Only the best of the best will be made available to investors. When you have opened an account and proven you are an accredited investor, you will be able to browse through the various opportunities. There is a 30 day cooling off period from the SEC when you first open up your RealtyShares account. Each project will have the most up to date and relevant information and documentation for you to analyze. You can make investments in any of these projects. You need to wait for the project to be fully funded before the transaction processes. Once you have done so, you can easily track the performance of your investments through the dashboard. This includes providing you with year-end tax information that is a good helping hand. 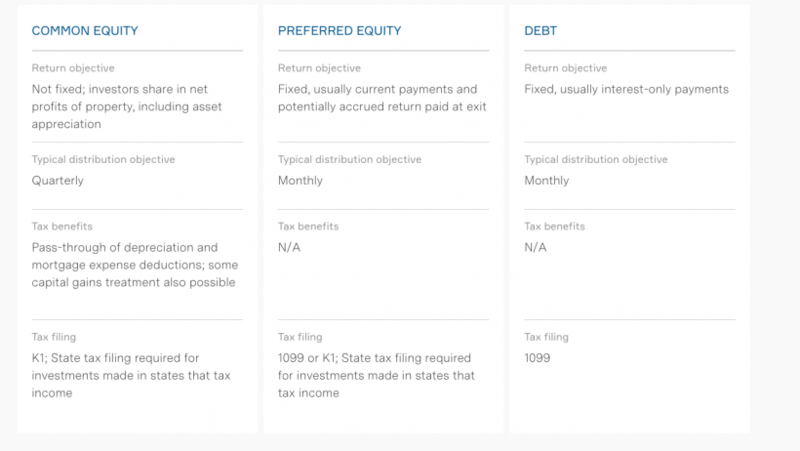 With common equity, you will usually get a quarterly distributions. There is no fixed return on the project. The return will depend on the net profits from the sale of the property. There are monthly distributions with the preferred equity option. This will have a fixed return from the outset. Finally, with the debt option you will have a fixed return and you will be getting monthly interest payments. There are three main different types of investment products on offer with RealtyShares. Each of them will have their own respective return and risk profiles. You can use them to diversify your holdings. With the debt option, you are able to provide finance for a loan that is usually secured on a given property. With the preferred equity option, you will have a priority equity interest in the given entity which is investing in a property company. Finally, with common equity you will be owning an interest in a property company that is investing in real estate. The only way you can make deposits and withdrawals to Realtyshares is through bank transfers. You will link your bank account to the platform. You do so using the bank account number and the routing number of your account. RealtyShares takes your financial protection very seriously when you are linking your account. When you get income distributions, you can reinvest, keep them on the platform account to withdraw them quickly to your bank account. With RealtyShares, they have an okay FAQ section that will answer some of the more basic questions that you may have. Otherwise, you are able to contact the customer support team through their toll-free phone number, by email or by sending them correspondence by mail. Realtyshares takes their security very seriously. They utilize SSL that has 128-bit encryption, which is what most banks are using. 3rd party security companies often look over the platform to ensure that the latest security risks are being looked after. No banking information is kept on the company's servers and the debt security investment will be protected by FDIC insurance. Overall, RealtyShares is an established platform that has proven to be reliable over the years. Accredited investors as this platform is only open to them. The low minimum required investment is also helpful for these investors. Investors looking to diversify. RealtyShares has one of the most diverse offerings of real estate investments and types of investments in the space. Investors looking for security and reliability. RealtyShares has an established track record in the space of being reliable and they take their security very seriously. Investors looking for various types of return. As you have a selection of three investment types, you can go for fixed returns or you can also go for the variable returns which could work out handsomely for you.